I’ve hesitated sharing this because this project is still many months out, but….well, I can’t resist any longer. Ever since I returned to publishing at the beginning of this year, I’ve wanted to write a space opera type series. I looked at the top cover designers and while I love their covers, I wanted to do something completely unique. So, after coming up with a 1200 word off-the-cuff description of the main ship/characters, I went to the amazing Allen Grippin, a 3D modeler who helped me with the model of the Russian Typhoon that was used as part of the front of the second Arkhangelsk Trilogy book. I gave him the rough, completely random and off the wall 1200 words below, described the general shape of the ship and asked him to make me a model that I could use for covers for these books when I finally am able to start writing them later this year. Allen delivered in spades. What you see above is the clay model (the VERY first step) outline for the ship, showing roughly what she’ll look like (when the final model is done, I’ll share that as well). If you think the picture above looks blocky and odd, well, she was modeled in virtual clay, and hasn’t even had proper modeling done yet. That is happening right now as I type this up, though, and the result is going to look nothing short of spectacular. Her tentative name is King’s Fall (this might change, but we’ll see)( and I’m completely in love with her. I wish that my plate wasn’t so full with writing post-apocalyptic and urban fantasy books right now so that I could start writing about her and her captain, but I’ll get to it soon enough. In the meantime, here’s that very rough, completely unedited and random 1200 word short I wrote for Allen to help with the inspiration for the ship. Let me know what you think, and if you enjoy space opera and military space type books, let me know what your favorites are. I haven’t read many of them, and I’ll have to pick one up here soon and check it out before I start writing my own. The King’s Fall shuddered as it skipped against the outer layers of the planet’s atmosphere, turning her grey exterior a dull orange from the intensity of the heat. Her engines howled in protest as they were pushed to their limits and every seam and bolt across her hull shrieked in agony. While she was more than capable of making planetfall, she was never meant to make a hot entry, and her intra-hull shielding was the only thing holding her together. “Try again!” Captain McConnell yelled over the sound of the klaxons as red and yellow lights washed over his face. Another shudder reverberated through the ship as her barely-functional shields took a blow from the vessels following close behind. Federation corvettes were lighter, faster and nimbler than the King’s Fall, and though they could never match her in sheer speed, they more than made up for it in handling. Light fire from the King’s Fall‘s defensive grid was too slow and predictable to do anything to the smaller ships and they were quickly closing the gap. The lead corvette fired again, sending another shockwave rocking through the ship. The helmsman manipulated her controls and the King’s Fall‘s pitch changed. The spacecraft rose away from the planet at a shallow angle and the three corvettes behind her closed in for the kill. As they lined up for their final shots, two massive plasma cannons emerged from the underbelly of the King’s Fall. No longer at risk of being shorn off by an impact with the atmosphere, the cannons fully deployed in less than a second and the ship’s automatic targeting systems took care of the rest. The lead corvette, positioned between his wingmen, never saw the shots coming. His ship’s shields, while strong enough to deflect low-level fire, couldn’t withstand the force of twin Kortuga-class plasma cannons hitting at the same time. The size and speed of the plasma charges made them impossible for the small craft to dodge, too. Bright flashes of blue were the last thing the pilot saw as his ship erupted, sending pieces of metal and debris hurtling through space. The destruction of their leader caused the other two corvettes to immediately break off to the left and right as they swung wide and up, trying to move out of the line of sight of the plasma cannons. As soon as McConnell saw the ships begin to move away, he shouted at the helmsman. The King’s Fall groaned as her thrusters forced her to change direction, heading back down toward the planet at a steeper angle. The plasma cannons retracted inside the ship just as her nose hit the atmosphere, plunging down into the steadily thickening gas like a whale descending into the depths of the sea. Covered with thick, noxious gases, Helios 2 was the perfect cover for the King’s Fall, due to the cloud cover’s ability to disrupt sensors of nearly any type. The only way to maneuver on the planet was through computer guidance and detailed maps of every mountain and valley. As the ship slowed in her descent and the friction fires began to die off, Captain McConnell slowly relaxed his death grip on the railing in front of him. “Do we have navigational guidance?” He directed his question at the helmsman, who nodded. The King’s Fall slid through the gas with ease as her computers used her point of entry along with known maps of the planet’s surface to guide her to a flat area several kilometers away from the closest port. Three struts extended from her underside as she turned to help halt her forward momentum, cruising steadily for the chosen landing point. Nestling in between two large mountains, the King’s Fall touched down with a surprising amount of grace given her size, and the crew was soon working to run diagnostics to see just how much damage they had sustained in the fight that had lasted for over sixteen hours. From the outside, the King’s Fall didn’t look like much. Her odd shape made it difficult for most people to identify her original manufacturer, and most computer systems didn’t have her class registered in their databases – though that was likely due to the fact that the King’s Fall was one-of-a-kind. While the King’s Fall looked ungainly at first glance, she was more than a match for anything three times her size. 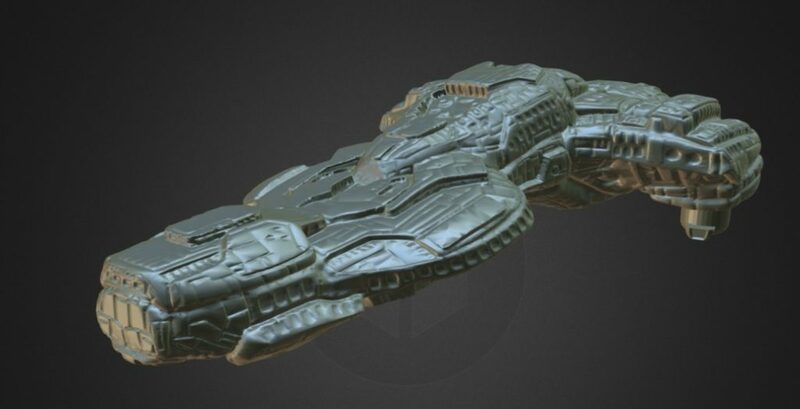 She was originally constructed as a Federation experiment as a way to try and miniaturize weapon systems that could normally only be carried by cruisers and battleships and carry them in a ship far smaller and more agile. With a length of around three hundred meters, her size was in between that of a frigate and a destroyer, capable of holding over 300 crew, but she had a crew complement of only twelve, made possible by the other Federation experiment she was created to test – a whole-ship AI. The King’s Fall‘s AI was named TOM, short for Total Operations Manager, which wasn’t what the AI was originally called, but the original acronym was a dozen characters long and didn’t spell out a name, so McConnell renamed the AI to ‘TOM’. TOM managed virtually every part of the ship, and could even pilot, maintain and perform limited repairs on the ship completely autonomously. When the weapon systems of the King’s Fall failed to live up to expectations and TOM turned out to have more bugs in his system than were worth fixing, the Federation decommissioned the ship and it was sold at auction. Fortunately for Captain McConnell, while the original weapons systems were removed, TOM had not been wiped from the ship’s computers as had been originally intended. Seeing the potential in having a ship at his disposal that could be run on a skeleton crew, McConnell spent three years retrofitting the ship and working on TOM. The final touch was the installation of her signature weapon system, the twin plasma cannons tucked away in her wings that had been “acquired” from a Federation battleship construction yard.